Formula Design / Blend | Technology | FUJICOPIAN CO., LTD.
extraordinary business transformations can be achieved. High value business impact is our goal. Uniqueness is born from creating original products. Fujicopian possesses the technology necessary for independently designing and developing coating liquids in order to meet client demands in a timely and exact manner. We make full use of materials engineering, inorganic and organic chemistry, and dispersion technology to develop a functional coating liquid with the desired features. The formula design/blend technology created through development of character and image printing media is used to develop the various high value-added products demanded by our wide spectrum of clients as well as by the changing market, and we are continuing to achieve further evolution. Characteristics of ingredients are combined and a number of tests performed, and out of this a formula that matches the demands and desired features is produced. 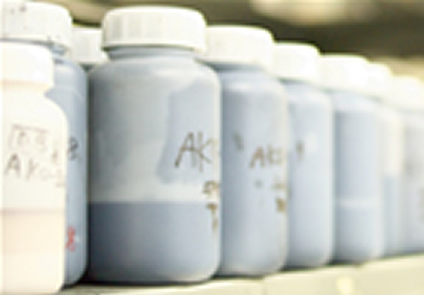 We create coating liquids containing unique characteristics through utilizing extensive blend technology established through a wide range of experience. At Fujicopian, where we perform tasks on up to coating, we also focus on the ease of the coating operation.